Show her it’s a man’s world. Van Heusen ties for men only! Brand new man-talking, power-packed ties that tell her it’s a man’s world… and make her so happy it is. 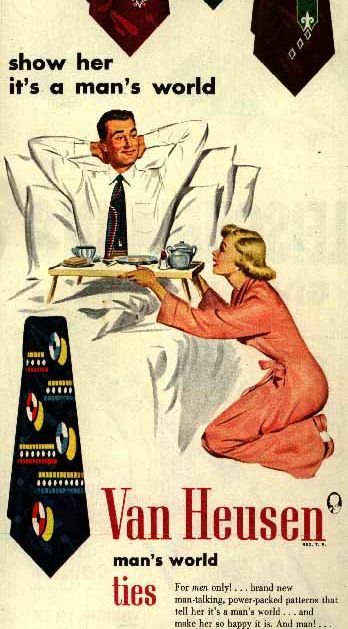 Let’s say it’s true — the tie gets a woman to be that submissive for you. – does she get spanked *before* or *after* breakfast in bed? – is the tie like Samson’s hair? Once you take it off, do you lose all your power? what a find! have never seen this image before. this stuff is amazes me. simply classic. Tomorrow, I’m buying all new ties!